8 Ways To Wake Up Looking Picture Perfect For A Selfie! You know those women in TV serials who wake up with their mascara in place and their perfectly-lined pout still glossy? That’s Indian television for you. Unfortunately, us ordinary mortals find it hard to wake up looking like we just walked out of the salon. But we've got a solution - tried-and-tested methods that can make you look fresh as a daisy every morning. 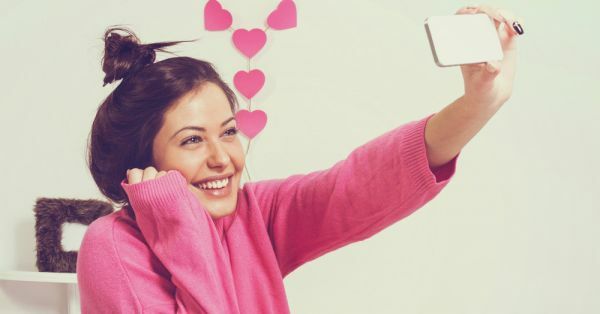 These methods are so effective that you can wake up, click a selfie and caption it - “I woke up like this”; much to the oohs and aahs of your social media followers. Here are 8 ways to wake up looking hot damn! 1. Follow a strict beauty regime before bed! Notice how we said strict? Well it ought to be if you’re looking at dewy, fresh skin in the morning. Make sure you clean, tone and moisturise (CTM routine) before bed, thus ridding your face of all makeup and dirt and keeping your pores in check. Make sure you use a cleanser and a moisturiser that suits your skin type. In a week, you’re likely to see hydrated, plump skin. While a healthy diet does ensure your skin stays in top shape, a clean, balanced diet before bedtime is essential before you go to sleep. Eating carb-rich food and/or drinking caffeinated drinks before you hit the sack can wreck havoc on your skin. Those puffy eyes most of us wake up with in the morning? Caffeine and dehydration are the culprits. Instead of caffeinated drinks, drink a lot of water throughout the day to keep yourself hydrated. You could also incorporate fibre-rich foods in your diet for clear skin. 3. Please, for heaven’s sake, buy a better phone! If you’re using a phone that does not have the features required to click a good selfie, you can sure your selfies will be doomed anyway, regardless of the lifestyle changes you make. We love the OPPO F1s, an advanced version of the Selfie Expert F1, which is taking selfies a step further with a 16 MP front camera, a sophisticated Beautify 4.0 feature and an industry leading 0.22s fingerprint reader and it currently tops our list of phones to get our hands on. And if you think your selfies are worth sharing, participate in the “Review Selfie Expert OPPO F1s to Win” contest - where you can take a selfie, review the F1s and upload them to OPPO’s official website. You could win a chance to be clicked by a top Bollywood photographer and featured in a top fashion glossy. 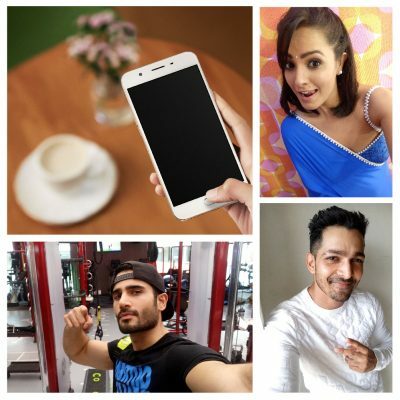 Celebs like Karan Tacker, Harshvardhan Rane, Anita Hassanandani and Sonal Chauhan are joining the race to win. What are you waiting for? Filters make you look pretty, sure, but do they hide a double chin? Most probably not. And so, a good workout packed into your day ensures you’re fit. Not only that, working out releases endorphins that make you happy and increase your self-confidence. And what else do you need for the perfect selfie apart from confidence and happiness? Well, not actually sleep like one, because babies sleep ALL the time. What we mean is, sleep on time and wake up early. A good eight hours of sleep ensures your body is rested and your mind isn’t foggy in the morning. Undisturbed sleep makes sure your body rejuvenates itself, so before you get to bed, switch off all electrical devices and encourage your body to relax. Practising breathing exercises might help you sleep better. An early dinner ensures you don’t feel bloated the next day. “Man, my face looks so fat!” - sound familiar? A bloated appearance is the biggest cause for deleted selfies and low self-confidence. Shun the bloat, eat an early dinner that is rich in fibre and protein and try and stay away from too many carbs. A healthy mane, as inconsequential as you think it may be, is super critical to your selfie success. A thick head of glossy hair makes sure your selfies look like you just stepped out of the salon. But how to ensure you hair looks as pretty in the morning as the night before? Brush it! 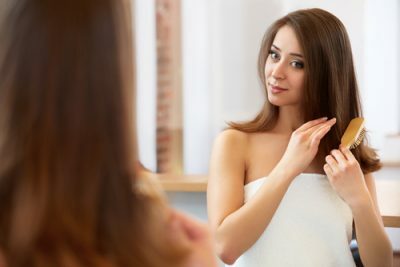 Brushing your hair before you hit the sack ensures the oils secreted from your scalp spread evenly on your strands. As a result, they look glossy and frizz-free when you wake up. No one likes chapped lips, especially not the over-critical trolls who are a small, insignificant-but-nasty part of your friends and followers list. And so, you’ve got to make sure that your lips are in top shape when you wake up. Thankfully, it’s not hard to maintain a perfectly plump and hydrated pout. Make sure you wear a lip balm with SPF when you step out in the sun. And before you get to bed, make sure you apply a regular lip balm to keep that pucker hydrated all night. Really good at clicking selfies? Participate in the “Review Selfie Expert OPPO F1s to Win” contest by buying an OPPO F1s, clicking your selfie and uploading your best selfie and review of the phone on OPPO’s official website. Five contestants win a chance to get shot by ace photographer, Dabboo Ratnani, and their pictures will be published in a leading fashion magazine. Top five contestants with the most ‘likes’ win a free F1s. What’s more? Every participant can spin a lucky wheel for the chance to win an F1s, Ollie (OPPO’s mascot) or a selfie stick. *This is a sponsored post for OPPO. Visit OPPO’s official website for more details about the contest.